Before we get started, we just wanted to remind everyone that this Friday, April 5th, at 11:00 am MT we will be hosting a Q&A Livestream with our founder, Nathan Seidel and the lead of the TensorFlow Mobile/Embedded team, Pete Warden! This Live Q&A can be found on our Youtube channel where you will be able to ask anything about the SparkFun Edge Development Board, TensorFlow, Machine Learning, and more! You can even ask a quesiton here and we can bring it up in the stream first. We'll see you there! 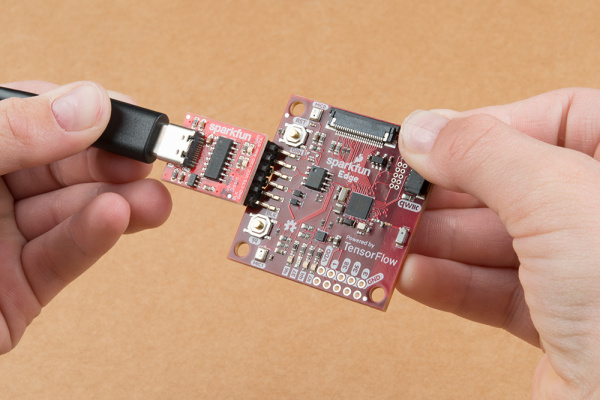 If you're one of the first customers who ordered The SparkFun Edge board, we’re with you – we can’t get enough of this microcontroller-based machine learning either! If you haven't jumped on board yet, what are you waiting for? Maybe this will help! What does the SparkFun Edge do? The possibilities of the Edge are thrilling, but at $15, it’s not exactly your personal assistant. We admit the Google Assistant has made our shopping lists more complete & efficient than ever before, but the feature set of The SparkFun Edge on day one has us more excited! What is available right now when I get the SparkFun Edge, you ask? The Edge has mind-bendingly low power consumption, measuring in at 1.6mA@3V at a full speed of 48MHz with no sleep cycling, and can run solely on a CR2032 coin cell battery for up to 10 days. The accelerometer and microphones work and have example code in the SDK. Note that currently there is only a TensorFlow example for voice recognition, and it has aspects that are rough around the edges. No pun intended. Check out this tutorial from Google - Machine Learning on a microcontroller with SparkFun & TensorFlow - to get the preloaded voice recognition script working. Be sure to familiarize yourself with the SparkFun Edge Hookup Guide, which details all the hookup accessories and board layout referenced in the codelabs tutorial. Please keep in mind that going through the TensorFlow build process can be a bit challenging. If you just want to have the SparkFun Edge blink for “yes,” you can flash the pre-built application from our BSP by following our SDK tutorial. Not enough for you? Take things a bit further and build and flash the binary to understand how to reflash the SparkFun Edge board, start playing with the code and try modifying the behavior! Add I2C sensors/devices using the Qwiic connector, or just make different LEDs turn on. Programming the board is done with an external USB-serial adapter like the Serial Basic Breakout via a serial bootloader. If page three of the codelabs tutorial leaves you looking for more details, look no further than Using SparkFun Edge Board with Ambiq Apollo3 SDK or the TensorFlow Lite experimental software repo. What’s next for The Edge? We are working with TensorFlow to improve the algorithm over the next few months. Similarly, we've made promising steps toward making the camera interface work, but we are a few months away from frame capture and possible recognition. We intend to push software updates to you over the next three months after release, and features we would like to see added in the next 6-12 months as TensorFlow updates their algorithms. I have been following your Youtube channels from long time. Its pretty cool channel. Expecting more videos from you. Question for the live Q&A: The camera connector is included on the Edge but camera support is still under development. Could we get an overview of this work and the plans, as well as some initial pointers (e.g. how is a camera actually connected to the connector - cable or male-female pair, and what available cameras actually can be connected) so we can get started and participate on the camera support development? Open MV cameras are mentioned but there are no hookup instructions. Thanks in advance! I'd just go ahead and place the backorder. We are building more at the moment, and they should be back in stock soon.